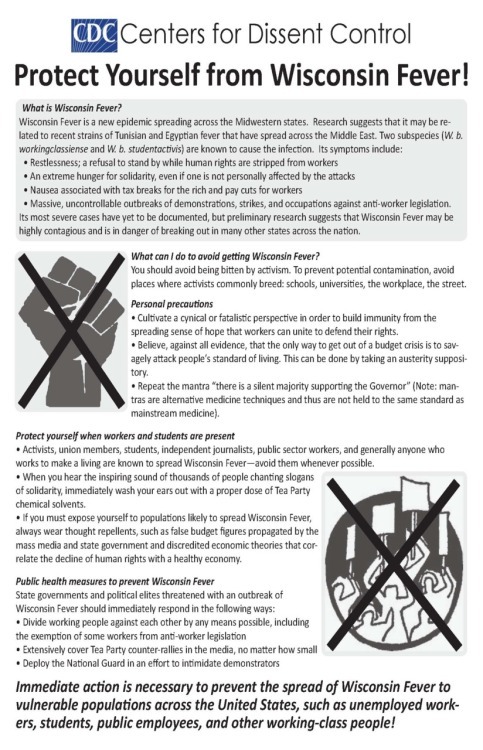 Centers for Dissent Control Advisory: Protect Yourself from Wisconsin Fever! Protect Yourself from Wisconsin Fever! * Massive, uncontrollable outbreaks of demonstrations, strikes, and occupations against anti-worker legislation. Its most severe cases have yet to be documented, but preliminary research suggests that Wisconsin Fever may be highly contagious and is in danger of breaking out in many other states across the nation. What can I do to avoid getting Wisconsin Fever? You should avoid being bitten by activism. To prevent potential contamination, avoid places where activists commonly breed: schools, universities, the workplace, the street. * Cultivate a cynical or fatalistic perspective in order to build immunity from the spreading sense of hope that workers can unite to defend their rights. * Believe, against all evidence, that the only way to get out of a budget crisis is to savagely attack people’s standard of living. This can be done by taking an austerity suppository. * Repeat the mantra “there is a silent majority supporting the Governor” (Note: mantras are alternative medicine techniques and thus are not held to the same standard as mainstream medicine). * Activists, union members, students, independent journalists, public sector workers, and generally anyone who works to make a living are known to spread Wisconsin Fever—avoid them whenever possible. * When you hear the inspiring sound of thousands of people chanting slogans of solidarity, immediately wash your ears out with a proper dose of Tea Party chemical solvents. * If you must expose yourself to populations likely to spread Wisconsin Fever, always wear thought repellents, such as false budget ﬁgures propagated by the mass media and state government and discredited economic theories that correlate the decline of human rights with a healthy economy. Immediate action is necessary to prevent the spread of Wisconsin Fever to vulnerable populations across the United States, such as unemployed workers, students, public employees, and other working-class people! And keep spreading it everywhere! We are watching you in New York in absolute awe.